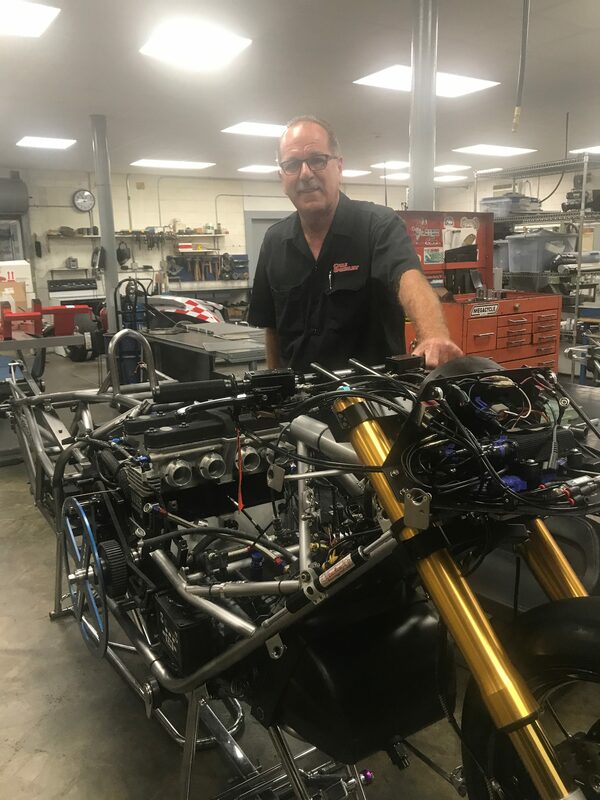 With just two races to go in the ManCup dragbike series, Top Fuel Motorcycle legend Larry “Spiderman” McBride enters this weekend’s race at Rockingham Dragway, Sept. 23-24, locked in a tight championship battle with veteran Sam Wills. A mere five points separates the two talented racers. Larry “Spiderman” McBride working on his record-holding motorcycle at his Newport News, Va.-based shop. The Spiderman has been in this position before. Last year’s championship came down to the final race in Valdosta, Ga. McBride and his team understand, at this point in the season, every run is amplified in meaning and importance. Wills is the tour’s most recent winner, having upset the Spiderman in the final round of the eighth-mile race at Galot Motorsports Park in mid-July. The 16-time champion has made great strides since the defeat, running a career best and national record of 5.74 at the IDBL Bike Fest at Maryland International Raceway, July 28-30. “We think we are on to something and I feel like we have made leaps and bounds. You never want to get too confident but I like where we are going,” McBride said. Rockingham has treated McBride well in recent history. Last season he captured the first event win for his new motorcycle “Star” there. Always striving for more, McBride plans to utilize Friday’s test session to try out some new components. 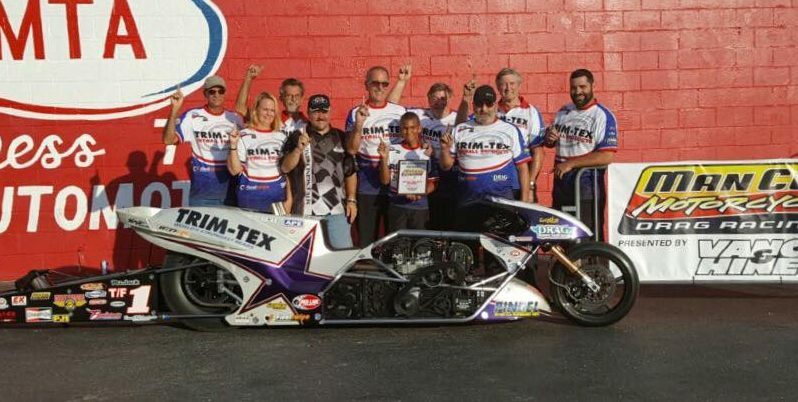 Larry “Spiderman” McBride and team celebrates the first win for the new motorcycle in Rockingham in 2016. McBride says there is one sure way to see this year’s tight points battle with optimism. “It’s a lot better to be five points ahead than five points behind,” laughed McBride. 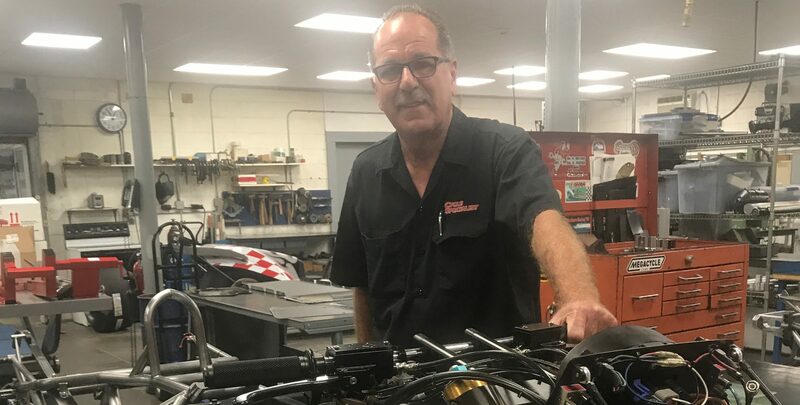 For all their continued support with this new machine, McBride thanked his primary sponsors; Trim-Tex Drywall Products, Pingel Enterprise, Drag Specialties-Parts Unlimited, Final Swipe Merchant Services, Web-Cam, APE and Kibblewhite – Precision Machine. Vance & Hines Motorsports, Red Line Synthetic Oil Corporation, Federal Mogul, Portable Shade, PR Factory Store, Ferrea Valves, World Wide Bearings, Vanson Leathers, Five Star Powersports, Belt Drives Ltd, Simpson Race Products, Nitrous Express, APE, EK Chain, Arias Pistons, Cometic Gaskets, B&J Transmission, Carolina Cycle, L.A. Sleeve, PJ1, Mickey Thompson Tires, Valco, Goodridge, Carlisle Belts, ProJack, Bullseye Visual and Gates Belts.